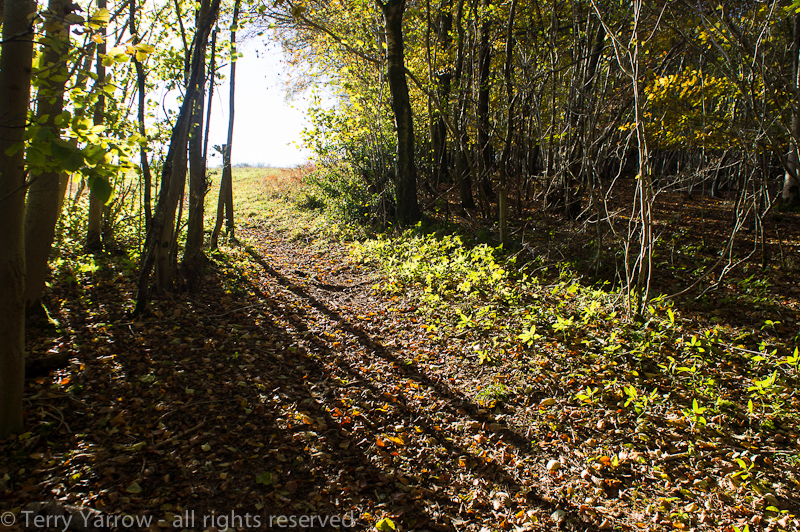 Of bright sunshine, eerie woodlands, raining lead shot, and a very DARK walk back! What a gorgeous morning this was! Bright sunshine on a crisp autumn day and this time I had made sure I had my gloves with me before I started out. 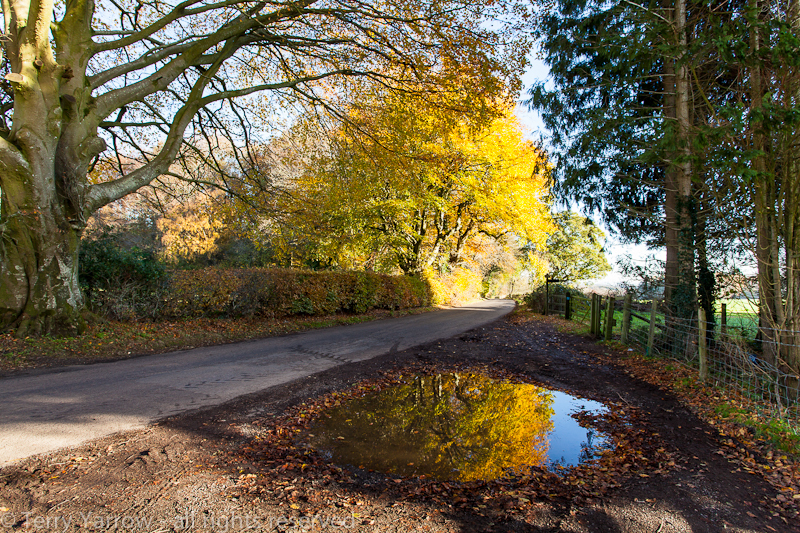 Not that I got very far before I stopped to get the camera out – I parked in a rough lay-by with a very nicely placed puddle to reflect the autumn trees. 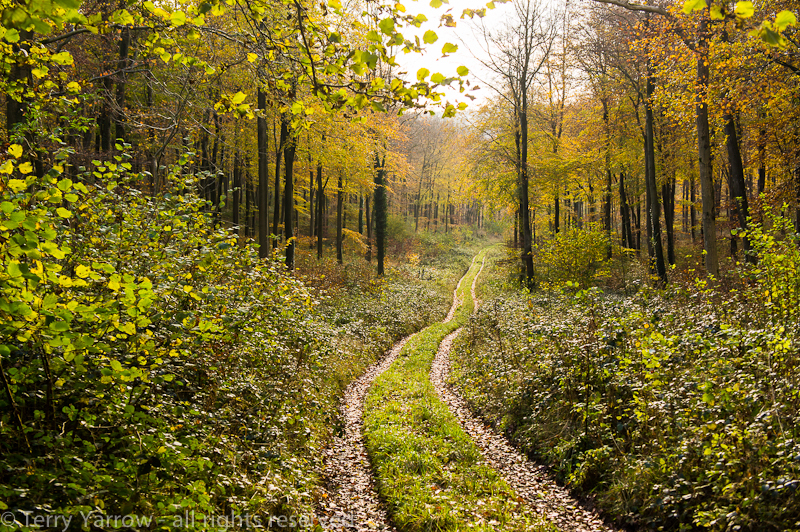 But soon, I headed out along that country lane for a short distance before turning off onto open fields. The day was chill and the grass still wet, and even though the sun had risen, the shadows thrown by the trees were long. These cold days are so much better for photography than the warm summer hazy days as the light has a clarity that really brings out the shades and shapes of the landscape. Today, I had the pleasure of the company of both sun and moon at the same time as the latter was clearly working the day shift. As lovely as it was to see the soft moon in the daytime sky, this was a pleasure that was to have consequences later! After a short time, my route left the open countryside and I walked through a doorway into some woodlands. The path descended into a deep valley filled with trees that had once formed a thriving coppicing industry although activities here had ceased long ago. This was an eerie valley, always dark, always damp, decaying wood everywhere, lots of moss, and with hardly a sound in the very still air. Little did I know it then, but this would be an even more eerie place later in the day as I made my way back! 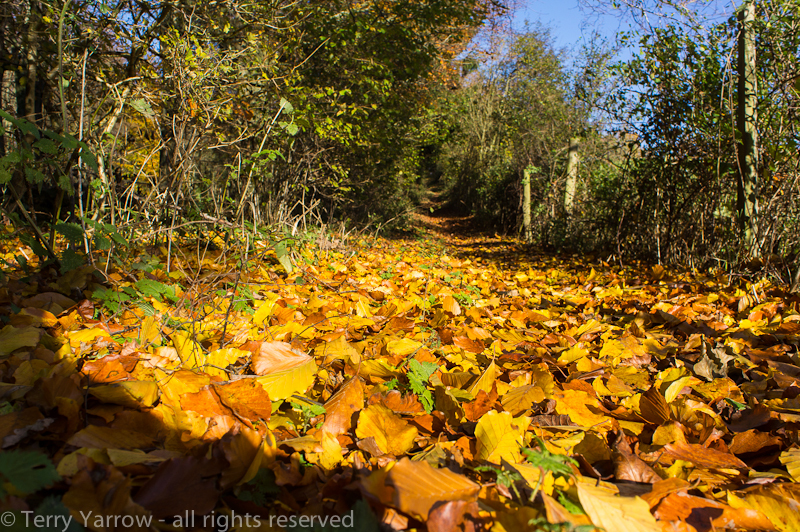 Eventually my route took a left turn and I walked along a path, carpeted with golden leaves, that climbed up the hillside into a more light and airy woodland. It is always a pleasure walking this stretch of woodland with the rustling of the leaves and the plaintive cry of the buzzards being the only sounds. It seemed like I was the only person out, but not quite – I passed an elderly couple walking their dog and we greeted each other as we passed. The old gentleman could walk no further so was taking a rest as his wife walked a little further along the path. At the edge of these woods I passed through the old gate in the picture below. I pass it regularly and yet each time I find myself taking yet more pictures of it. 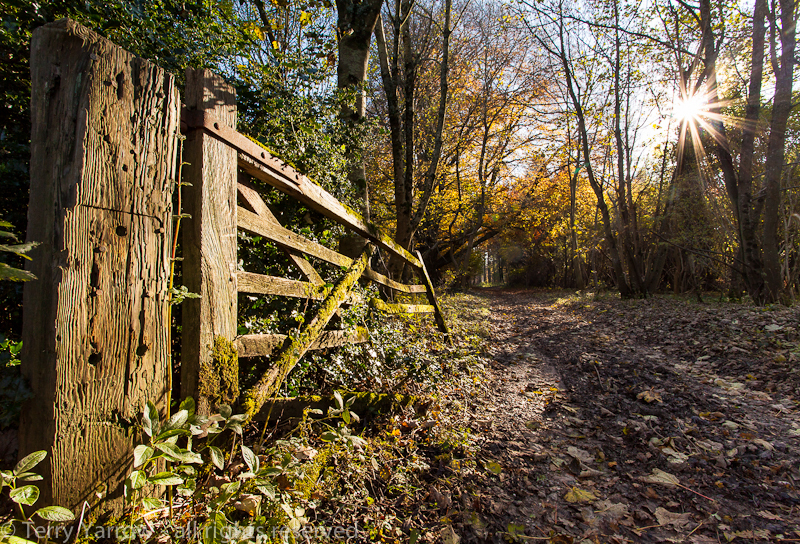 I never could resist an old wooden gate, especially with that lovely sunshine streaming through the trees! It could easily have been the gate that inspired Hardy to write, ‘I leant upon a coppice gate, when frost was spectre grey….’! A little further along, my path dropped down into what is one of my favourite valleys with the rather wonderful name of Shepherd’s Bottom. Normally there are sheep grazing which always seems appropriate in this place. Today there were none but it was still a lovely place to be. Dropping down into the valley, I passed through a small area of woodland before climbing up the other side to yet more woodlands. 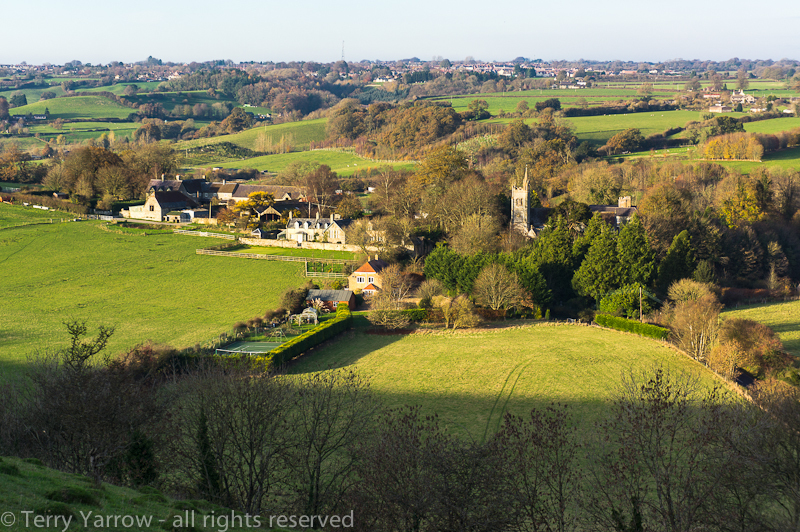 At one time of course the whole of Dorset comprised of woodlands or heathland and with so much of the land having been cleared for farming, it is good to see these pockets of wild countryside still remaining. This however was a working forest and signs warned of the danger from large machinery. By the time I had come out of the woodlands and onto the open hilltop again, it was time for lunch so I found a suitable seat……which was actually a relatively dry stile! The views from my lunch ‘table’ were amazing and even in the cold, I was happy to sit and look out across the valley beyond. My peace was disturbed however by men with sticks that had what appeared to be carrier bags tied to the end. They were walking the hillside waving their sticks and I quickly guessed their purpose. One of them, a young man with two spaniels in tow, passed by me. As he lifted his dogs one at a time over the stile that had been my seat, I asked him if there was a shoot, to which he replied, ‘Yes’. Apparently the guns were at the bottom of the valley and soon after I heard the first shot. As I packed up and walked on, gunshots echoed out constantly, and frequently I was rained on by lead shot. Although having lead shot falling on me out of the sky didn’t concern me, it did make me wonder what the long term effect would be on the farmland and the crops. 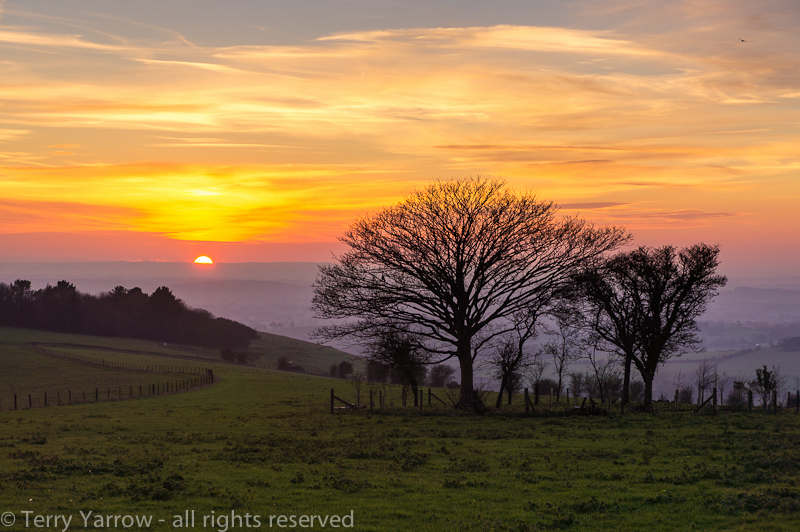 After some time, I moved away from the shoot onto a neighbouring hillside. My route was to take me down the side of the hill and through a delightful village. This is one of those places that you would normally not stop at but that really reaps rewards if you are prepared to walk and explore. 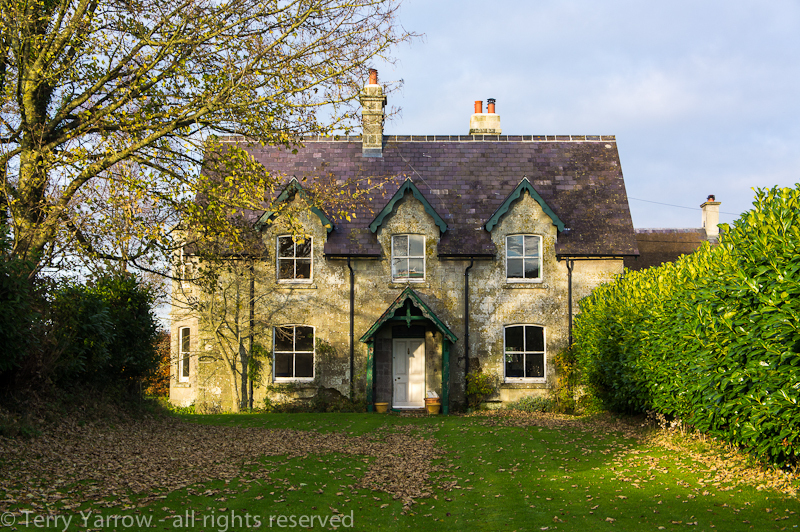 It has an old school, an old church, numerous cottages and farmhouses……. 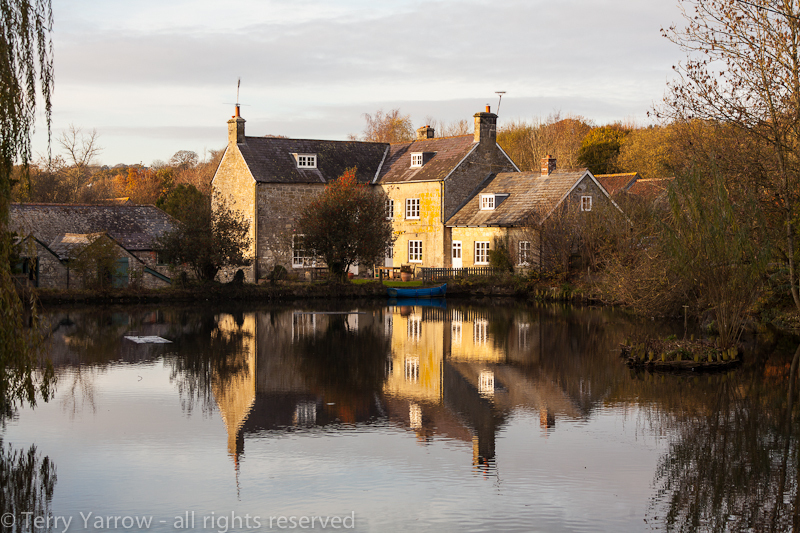 …….and even an old mill in a very picturesque position beside a beautifully still millpond. 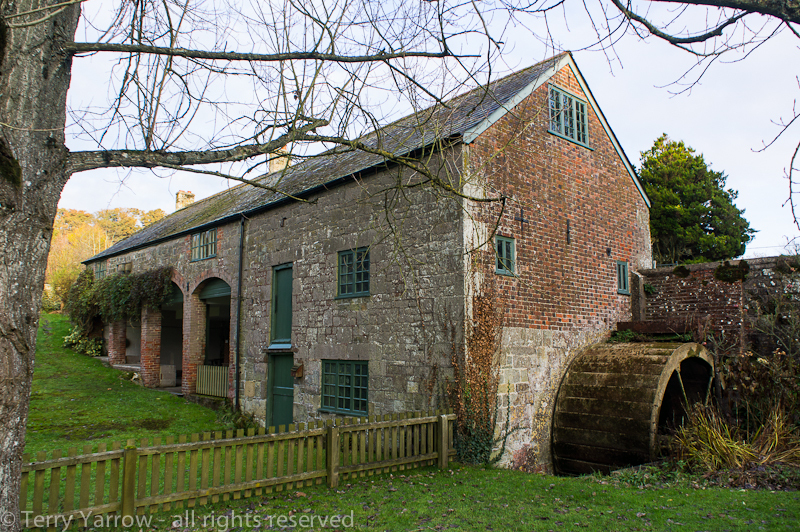 Once a busy village mill, this is now in a private residence. Leaving the village behind, my route took me beside the now slow flowing mill stream and out onto the narrowest of country lanes with high banks on either side. 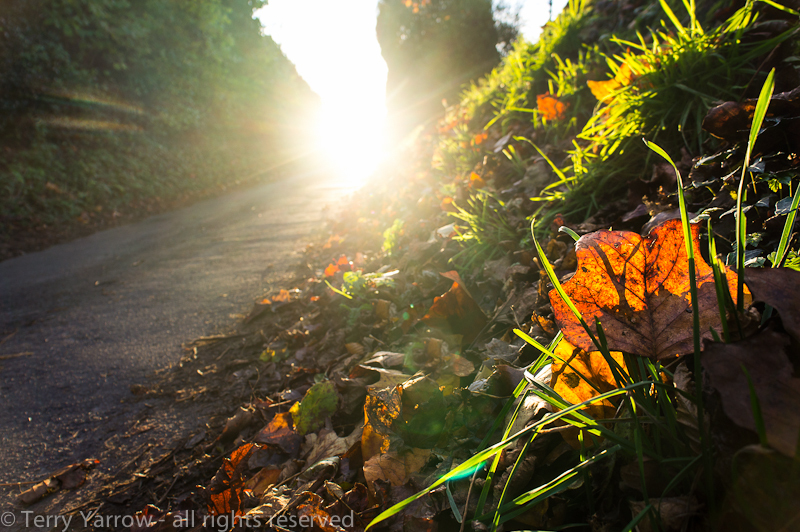 The sun was streaming straight down the road, highlighting the fallen leaves as if it were a spotlight and the leaf a starring player in a stage production. But this was better than any stage production! 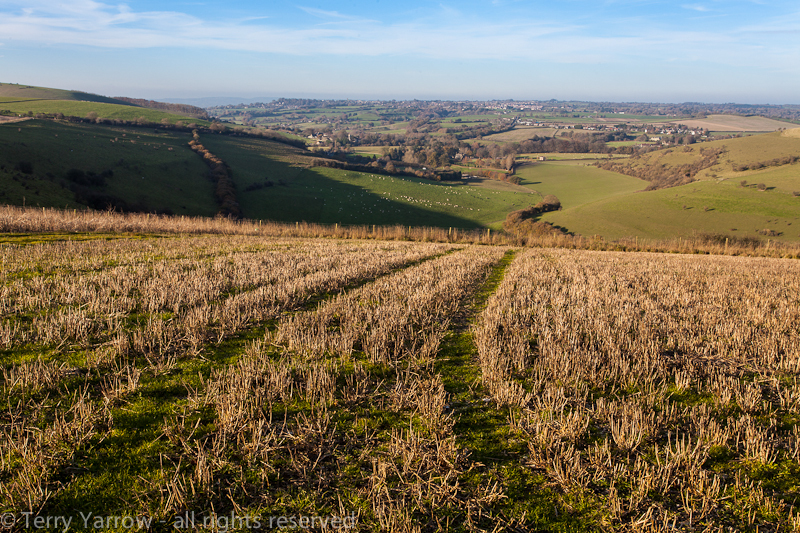 Climbing out of the valley, I ultimately crested one of the highest points in Dorset. 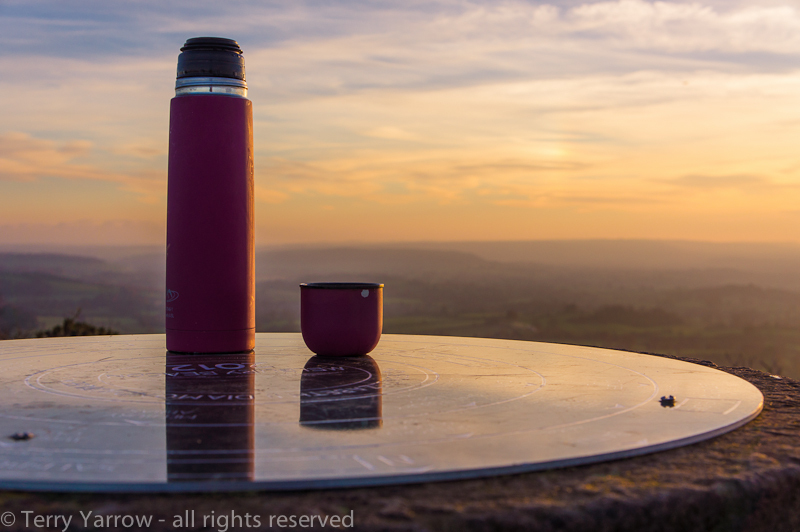 With 360 degree views over countryside and along the ridge, this is a spectacular spot to just sit and gaze. This is a place with a history as it was once the site of one of the chain of Armada beacons erected in the 16th century between London and Plymouth. How communications have changed since then! I lingered a while to enjoy the view, lost in my own thoughts. The breeze was gentle but cutting, with a sting in its tail and I was glad of my flask of hot Bovril to warm me. 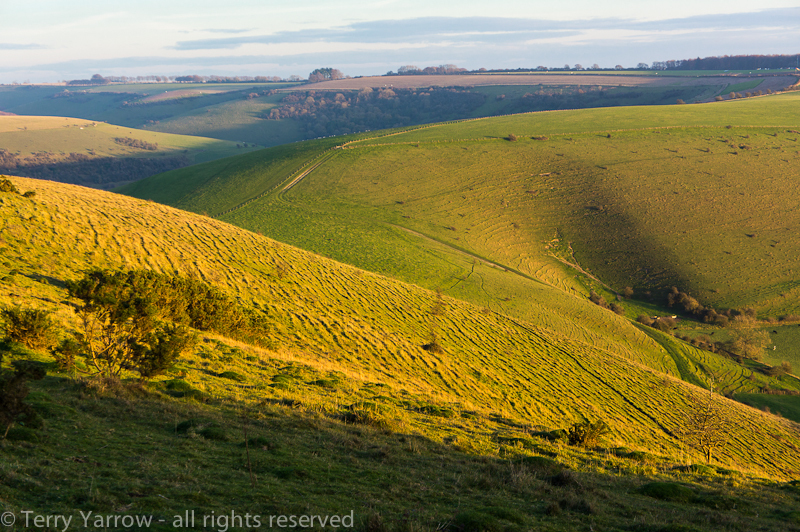 With the light fading fast, I needed to move on and so followed the ridge of hills for a mile or more, bathed in the warm light of the setting sun. Along this stretch I was not alone as I passed a group of people who were, like me, enjoying the sunset. Just as I reached the end of the ridge-top path and my route turned once again into woodlands, the sun dipped his toe into the horizon pool before diving headlong in and disappearing from view. This was a beautiful but slightly concerning sight as I still had several miles to walk! With the sun went the light! I entered the first area of woodland with just enough glow in the sky to enable me to find my way and avoid the huge areas of deep mud on the heavily rutted forest track. However, very soon the light had gone completely so I took my head torch out of my rucksack……only to find that the batteries were all but dead! The words of Thomas Gray came into my mind, ‘And all was left to darkness and to me’! Normally at this point the moon would cast his gentle glow to aid me but of course he had been up when I set out this morning so was still fast asleep! 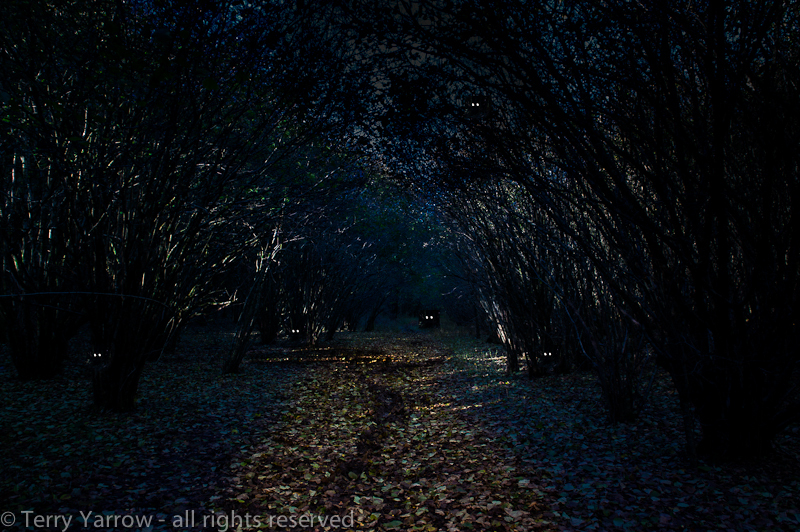 I entered a second area of dense woodland with only a glimmer of light with which to find my way. By now, I had given up trying to find my way round the mud but rather just ploughed through the middle. Being ankle deep most of the time, I slipped and slid my way slowly onwards along a track which in daylight would not have been easy to follow but in the dark………! Those eerie woodlands of this morning were even more so in the dark. The stillness was tangible! Owls hooted spookily all around me, leaves rustled, trees creaked like rusted door hinges, twigs cracked, broken by unknown feet, and the eyes of unseen creatures stared at me, caught in the slight glimmer of my head torch. I could not tell what the eyes belonged to other than to guess by their height off the ground. Every few yards game birds, spooked by my presence, panicked and took off noisily with thrashing of wings and screeching of voice. I hoped that they would be able to find another roosting spot in the dark! My way out of the woods was by the track I had come along earlier in the day but it was not an obvious track, especially with a heavy covering of leaf and mud, and the sign pointing it out was half hidden in the trees. However, eventually I found it! I made my way slowly up the side of the valley and after what seemed an age I reached the road from which I had started the walk. What a day! Fabulous sunshine, amazing views, interesting places and most memorable of all, a wonderful night walk in the deep, dark woods! I sat and enjoyed the rest of my Bovril before heading for home and a hot shower :)! 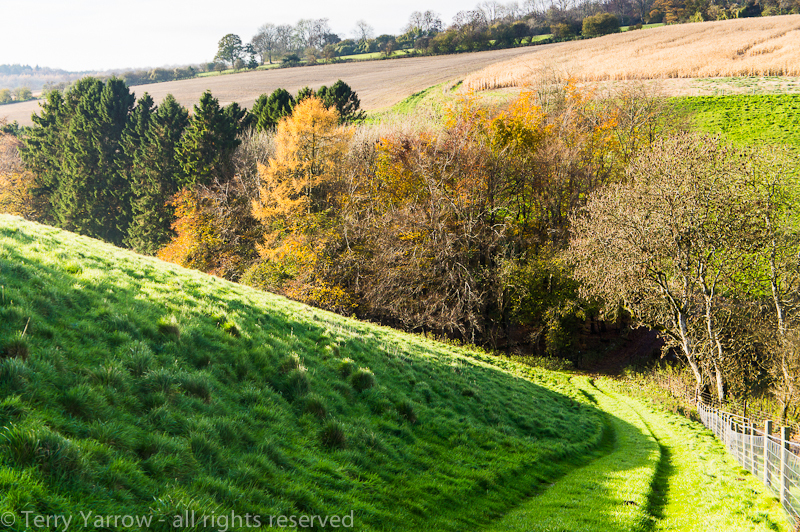 Previous Of a village with two names, autumn fruits and foliage, hill forts and hedgerows, and being older! 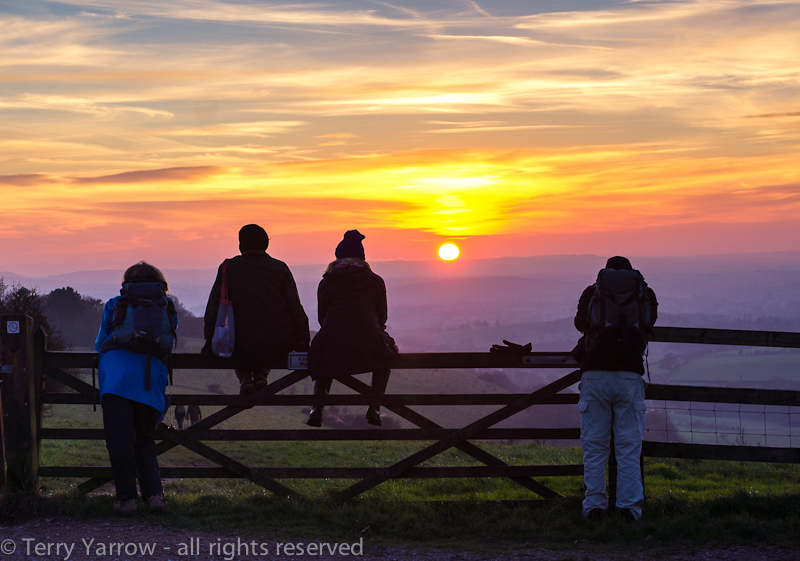 Next Of a canine encounter, a bloody battle, a blazing fire, a bright sunset……and of course, a HAPPY NEW YEAR! The photos are mythical–feel like I am walking with Pilgrim. That night shot is really something and a wonderful contrast to the gate and paths covered in gold. Beautiful sunset photos. And the woodland in dark photo is thoroughly creepy — reminds me of various spooky movies I’ve seen.